We all know people try dozens of Facebook Apps to kill time on Facebook. Although some are legitimate but majority of them are just scam. If you care about your privacy i.e. your personal details, then this article is for you. Apps like Who will murder you? and Know when will you die? are stupid from the logical sense and anyone can tell that they are fooling around, yet people try them. Apps like Chinese Zodiac also fool around but I must say, one was genuine and another one I found was just scrapping off your data. 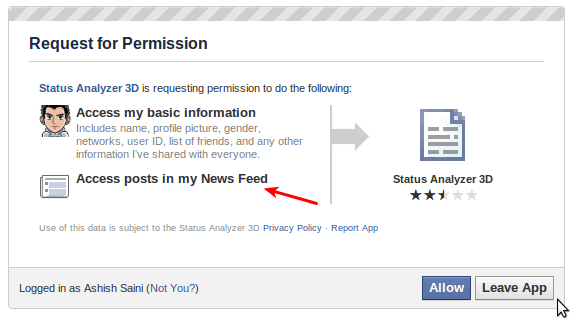 Facebook has privacy options which means you give permission to other people or apps to get access to your data. It all happens with your consent. In lieu of fun, people try apps which are malicious and were built with the intention of stealing your personal details. They then sell your details to companies and yes, there is a good market for that. What you can do to save yourself? First of all, stop fooling around with useless apps. Even if you are trying an app, pay attention to what permissions you are granting them while allowing access. Use some brain if they really need that much access to my details, if its suspicious, then it probably is. Let us go by a couple of examples. I tried this app named Status Analyzer 3D (link), which shows you a 3D cloud for the most common words found in your status updates. Alright! This is a worth one to try. Lets see the permissions it asks for. Access my basic information - Don't worry about this one. It's the information you already have shared with everyone. 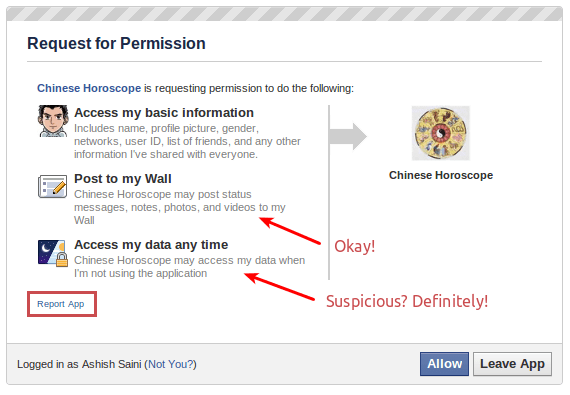 If you have right default privacy settings in Facebook then this is not a thing to worry about. Access posts in my News Feed - It needs to grab the status updates so that it can make out the most used words, makes sense. So trying such an app is fine. Lets try out a different app named Chinese Zodiac (link), which tells you about your Chinese Zodiac sign. I found a genuine one too, but in this context I will talking about the malicious one. Again lets see the permission it asks for. Access my basic information - Its okay! Post to my Wall - All the apps would like to share the result of what they do on your wall so that even your friends can see it and try them. Irritating and offending is the one which doesn't confirm with you before actually posting the result or anything on your wall. Access my data any time - Seriously? Anyone can sense something suspicious here. If not, fix yourself up before anything else. I can only imagine the use of it when the app needs to continuously access your date when it is doing some repetitive tasks for you. Most of the time, this is not needed. For such apps, don't allow them access and report them. I have already reported this app. Actually I even emailed the developer sometime back but never heard back from him. With over 500 million users around the world, the users are targeted for stealing their data and then selling this data to marketing companies and like. Stand up and save yourself. I will also write on how you can kill applications that have already access to your data. I only keep apps that I trust very much and if I even try out some app for fun, I remove that right away. Were you trying all those stupid apps? Or have you tried such apps in the past? Have your say in the comments. Your analysis for suspicious facebook apps is great. But, I wonder is there any way to have more analysis of what a facebook app is going to do with data. Is there any way to find a real company name and address for apps? I increasingly see such invitation from apps and I would like to inform my friends to be aware of them.